Every once in a while some computers in the offices of the Berkeley Seismological Laboratory (BSL) seem to take on a life of their own. A window with a map of California suddenly pops up, from the speakers blares a nasty siren and a computer generated voice proclaims: Shaking expected in 30 seconds. In the meantime two concentric circles, one in yellow and one in red, slowly expand over the whole map (see figure). Whenever this happens, BSL scientists get excited, because their prototype earthquake early warning system has detected another potentially damaging tremor. Scenario earthquake alert on the User Display for the Loma Prieta earthquake. The yellow circle shows the progress of the P-wave and the red circle shows the S-wave. Developed jointly by researchers at Berkeley, Caltech in Pasadena and the Swiss Federal Institute of Technology in Zürich, this fully automated system, dubbed Shake Alert, is designed to give people up to few dozen seconds of warning time before the seismic waves rock one's location. In most cases, this warning time is long enough for people to take protective measures (drop, cover and hold on) or even leave the building before the shaking starts. Currently a few organizations like BART use the warning to automatically slow down trains to a safer speed. As mentioned in the previous blog, the warning is possible when seismic stations very close to the quake's epicenter detect a temblor and relay the recording with the speed of light to the data center. As seismic waves are much slower than light, the data outraces the shaking. The further away the quake, the longer the warning time. 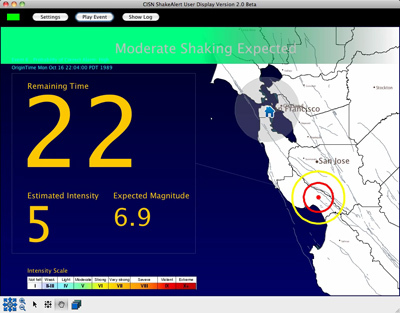 While Shake Alert seems to work reasonably well on a lab scale and for a few customers, it is by no means ready to be rolled out as a public warning system. On the one hand, there are too few earthquake stations in critical areas like northern or central California. This is where a truly great earthquake along the San Andreas Fault will most likely initiate. Another reason is that the data transmission network is not nearly as robust as BSL scientists want it to be. In many cases, the data transmission from the station to the data center has no redundancy and is prone to failure in a strong quake. "Technically, these bottlenecks can easily be solved," says BSL's director Richard Allen. "What's lacking are the funds to improve the network." In order to make Shake Alert a reliable public system for all of the West Coast (Washington and Oregon can have strong earthquakes too), an investment of about $150 million would be necessary. And what happens when an alert goes public? Californians need to be trained and understand, what to do in these critical seconds between the time the warning is issued and the shaking starts. "We need a major public education campaign," says Peggy Hellweg, BSL's operations manager and one of the principal investigators for Shake Alert. "To start and execute such an endeavor goes far beyond the capacity of our small lab," says Hellweg.